Building Community Together - White County United Way, Inc.
White County United Way eligible for $32,000 UnitedIN18 Matching Grant!!!! 1. Increase your annual donation by $100 or more; the increase will be matched. 2. Become a leadership donor by contributing $1000 or more; all increases over your previous pledge will be matched. 3. Increase the number of participants in your workplace campaign by 5% or more people; the entire workplace campaign will be matched. ​For more information, please contact Nikie at WCUW. Running a campaign at your workplace? Use the following documents as your "campaign tool kit." 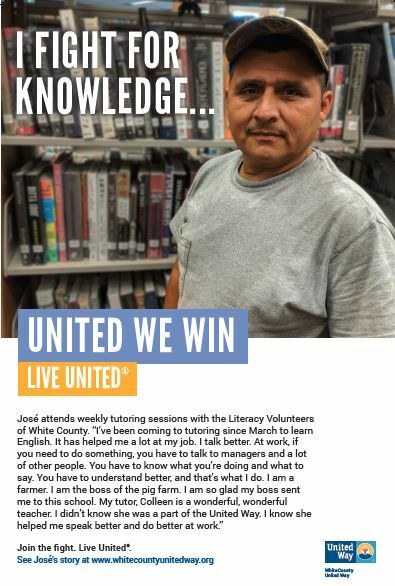 Would you like more information about a poster or a story you have seen about the United Way? Click Below.